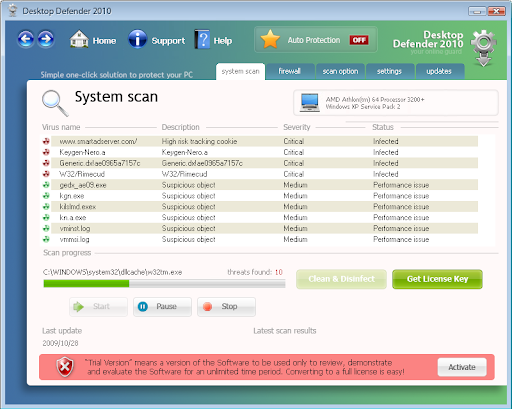 Desktop Defender 2010 is a new fake antivirus from the same family as: Contraviro and UnVirex. Like the previous versions, the database of Desktop Defender 2010 has been ripped from Clam AntiVirus (ClamAV), an open source (GPL) and free anti-virus toolkit. Notice the LSP Hijack: Removing siglsp.dll file without restoring the LSP chain will break Internet connexion. Leaving it will allow an infected componant to watch the network traffic. If your system is infected with Desktop Defender 2010, follow the Bleeping Computer removal guide. MBAM is the only free tool to remove completely Desktop Defender 2010 AND the LSP Hijack.